The Indian rupee rose slightly on Tuesday as gains in local shares improved sentiment even as global currency markets continued to see-saw because of conflicting signs coming from geo-political flashpoints such as eastern Ukraine. While the week started with sentiment weighed in favour of emerging market currencies due to hopes for easing political tensions, reports on Tuesday of a Russian aid convoy heading to Ukraine yet again increased concerns. That kept sentiment cautious, although the rupee was able to gain some ground against the dollar after the benchmark BSE index rose 1.4 percent to post its biggest daily gain since June 6 on optimism around corporate earnings. day for a better check on the domestic economy. Unnati Parekh, head of currency derivatives at Kanji Forex, an institutional forex brokerage in Mumbai, said it was best for importers to buy dollars now. "The pair has been in a range, but we have been advising importers to cover most of their requirements," she said. 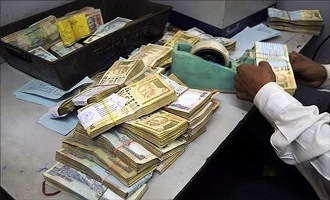 The partially convertible rupee closed at 61.08/09 per dollar, compared with Monday's close of 61.19/120. The unit has been rebounding after dropping to 61.74 last week, its lowest since March 5. Still, broader gains were capped after the euro fell towards nine-month lows against the dollar after a weak German sentiment survey raised concerns over the impact on euro zone economies of Western sanctions imposed on Russia. In the offshore non-deliverable forwards, the one-month contract was at 61.44/49, while the three-month contract was at 62.02/12.